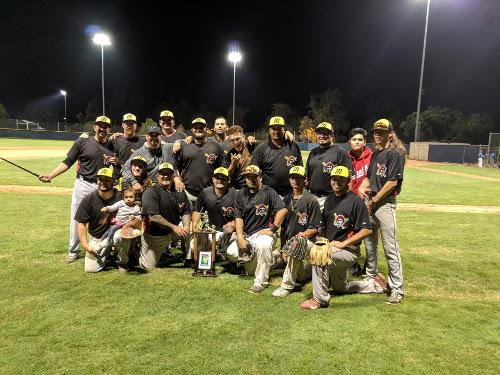 Back for the first time in 4 years, the PCBL mid-week league championship game featured the #2 seeded Pirates against the #1 seeded (undefeated) Dragons. With the Dragons led by division MVP Luis Rivas and the Pirates led by division Cy Young winner Peter "Beans" Curiel, this one could go either way! The Pirates struck first in the top of the first. After Dragon's pitcher Jeff Bejian struck out the first 2 batters, Jesus Lopez lined a sun-aided double to left center, and Frank Andrade singled him home to take a 1-0 lead. Curiel, doing his best "Ric Pozo" impression (throwing sub-50mph), worked a quiet first. Bejian settled down in the 2nd, but faced more trouble in the 3rd. After 2 quick outs, Chris Serrano singled and stole second. Bejian balked him to 3rd, and he scored on a passed ball. Heading into the bottom of the 3rd, the Pirates led 2-0. After an undefeated regular season, the Dragons offense wouldn't be quiet for long. In the bottom of the 3rd, skipper Rick Guerra walked and stole second. After Jose Banuelos reached on a hit by pitch, Bejian singled to load the bases. Stan Spancer crushed a line drive that 3rd baseman Jesus Lopez grabbed and took back to the bag for a double play. But Luis Rivas singled to load the bags again before Curiel induced a fly ball to get out of trouble. After 3 innings, Pirates 3, Dragons 0. Bejian worked around a single and a walk to strike out the side in the 4th, and the Dragons were back at it in the bottom of the inning. Erick Melara walked, and his runner swiped second. Richard Lizarraga made a productive out, moving him to 3rd, and Robert Reeves Sr hit a deep fly ball to left to bring him home. After 4, the Dragons cut their deficit to 2-1. Bejian worked another quiet inning, and the Dragons kept up the pressure in the bottom of the 5th. With new hurler Leo Alcala on the mound, Rick Guerra walked and stole second. With 1 out, Bejian walked, and both runners moved up on a Stan Spancer sacrifice bunt. The Pirates elected to intentionally walk Rivas, and the move paid off as the next hitter grounded out to first, leaving the bases loaded for the second time in 3 innings. After 5, still 2-1 Pirates. After walking a tightrope the last few innings, the momentum began swinging the Pirates way. With one out, Pancho Velasquez singled. Leadoff man Steven Montalvo reached on a fielder's choice/error, as the shortstop couldn't come up with the throw on a potential double-play ball. Marco Toscano beat out a double play ball of his own, and swiped second. Now with 2 outs and runners on second and third, Jesus Lopez looped a single into left to plate both runners, opening up a 4-1 Pirates lead. The Dragons went quietly in the bottom of the 6th, thanks to a web gem by Chris Serrano's diving stop at first base. 3 innings to go, and the Pirates still lead 4-1. Sal D'Angelo came in to relieve and kept the Dragons close, throwing 2 scoreless innings. Meanwhile, Alcala was on cruise control himself, matching zeroes. Heading into the 9th, Pirates still lead 4-1. Steven Montalvo led off the top of the 9th for the Pirates with a walk against new pitcher Luis Rivas, and pinch hitter Yovani Rangel bunted him into scoring position. With 2 outs, Frank Andrade hit an rbi-single to center to put up some insurance, extending the Pirates lead to 5-1. Congrats to the Dragons for an amazing season, but tonight (and the trophy) went to the Pirates - your Summer 2018 Mid-Week Champions! Congratulations to the 2018 Mid Week Summer Champion Pirates!